Creates a new preset based on the AutoAdministrator's current state. The current preset is removed. Not available for built-in presets <Last State> and <Default>. Changes the current state of application to the current preset. Allows selection of hosts for update. Selecting a group will automatically select all hosts within that group. Update results are displayed in the status column. The text of this button will change from "Start" for a non-destructive operation to "Update" for a potentially destructive operation to "Stop" while an update is in progress. Following an update, a summary of the number of hosts affected and the time it took is displayed here. The number of hosts currently selected for update. The actual number of updated hosts may be less, as this number does not check for duplicate hosts. 1) Use the network tree view to select the hosts to which the update should be applied. 2) Use the Feature selector to select the action to be performed. 4) Apply the update by clicking on the Update button. 5) Results are displayed in the status column for each computer. Red text indicates a failure, while green text indicates success. 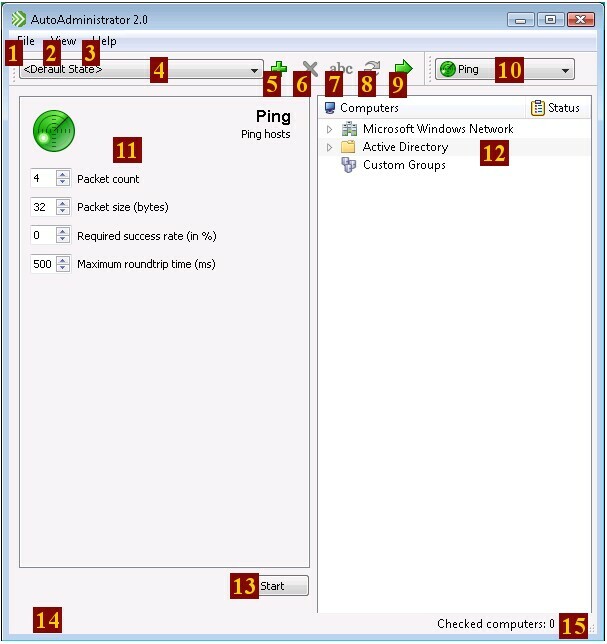 Custom groups allow computers to be grouped in an arbitrary fashion. This can be useful, e.g., if there is a subset of a domain that is commonly updated.